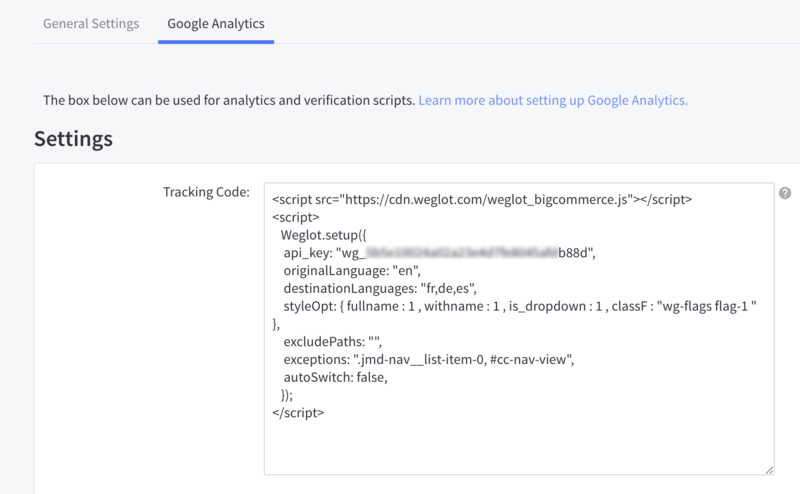 In this article, you'll find how to exclude a specific URL/block/paragraph from being translated on your BigCommerce website. Using Weglot, you can exclude some pages from the translation process. Doing this, those pages won't be translated at all and the button will not be displayed anymore. 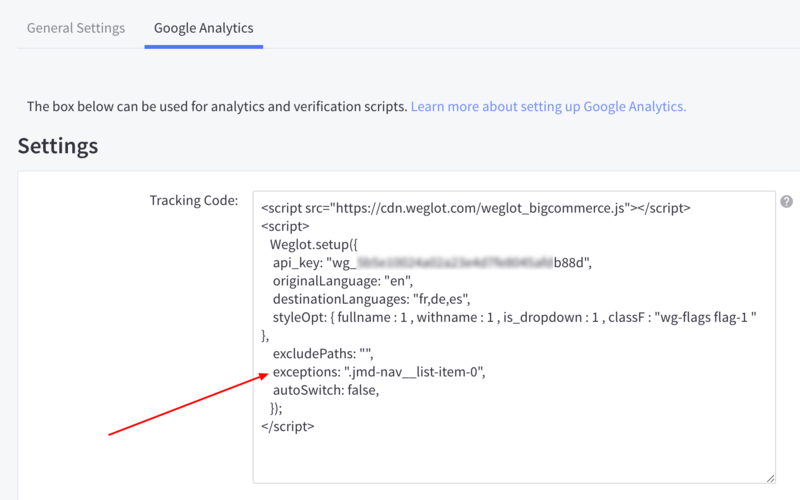 Once you have found that, paste this line to your head section (In your BigCommerce Dashboard > Advanced Settings > Web Analytics > "Google Analytics" section). If you add several pages, you must separate each page by a comma, as this section is a Regular expression (RegEx). Also, don't add any other characters like space. And do not end with a comma, that won't work properly. Note that Weglot doesn't automatically remove the translations related to the excluded page(s). Get more info: How to definitely remove a translation? Using Weglot, you can also exclude specific parts of your website like the header or your product's titles, for example, selecting a CSS selector. In this example, you have the choice to exclude either an id (cc-nav-view-2649987296) or a class ( jmd -nav__list-item-0). No matter the name of the selector, if it's an id, you must add a sharp "#" before and if it's a class, you must add a dot "." before. 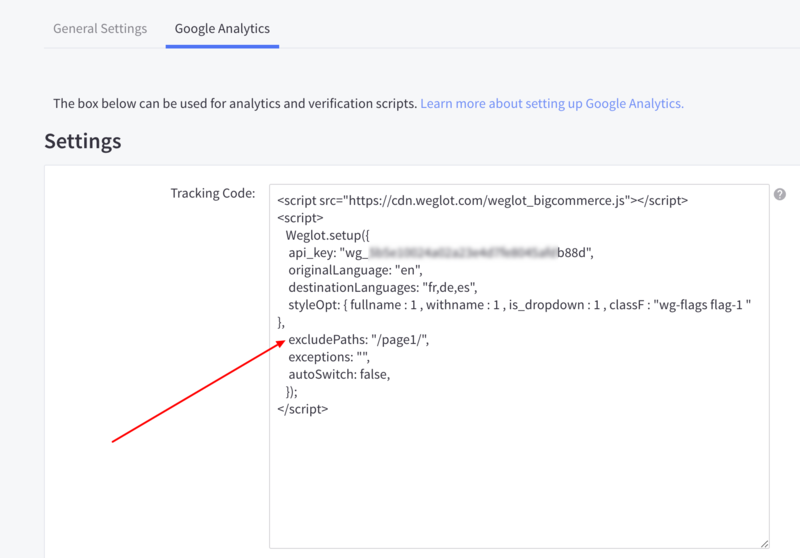 Once you have found the right selector, paste this line to your head section (in your BigCommerce Dashboard > Advanced Settings > Web Analytics > "Google Analytics" section). If you add several pages, you must separate each selector by a comma. Also, don't add any other characters like space. And do not end with a comma, that won't work properly. exceptions : "YOUR CSS SELECTOR 1,YOUR CSS SELECTOR 2"